How I Gained It: I was always chubby, even as a child, but I didn’t become obese until high school, and then I just continued gaining more and more weight. While I walked often and was active for someone my size, I had a horrible relationship with food. If I had a bad day, I would eat to make myself feel better. I would order enough for three people with the excuse of keeping leftovers for the next few days, but that rarely happened. If I had a good day, I would reward myself with food, because I had “earned” it. At drive-thrus, I would pretend to be picking up meals for several other people so that the person working the window wouldn’t know all of the food I was buying was for me. I ate lunch every day in my car so that my co-workers didn’t see the burgers, fries, onion rings, and chocolate shakes I consumed every day. I became lethargic, grumpy and depressed. My skin broke out from all of the grease that I was eating. Breaking Point: In addition to my general shift in mood, my knees had begun bothering me. They hurt all the time, to the point where I had to start putting ice on them at the end of the day, as if I was a professional athlete. One day, I turned a corner and my kneecap shifted, and it was the worst pain I’d ever experienced. What made it scary was that I hadn’t been doing anything physical, just walking. I was only 27 years old, my body shouldn’t have been feeling that way already. I knew it was the extra weight, and I knew I had to make a change or life would only get more painful. How I Lost It: My mother and a friend of mine had success with Weight Watchers, and on my 28th birthday, I decided to give it a try myself. I followed the point system strictly and found that it was easier than I thought it would be. I saw steady results right away and didn’t feel hungry the way that I thought I would. In fact, I still ate big meals, I just made sure that the big meals were made up of the right kinds of foods. My accomplishments inspired me to be more active. At first it was just walking and light weight-training. That was all my body needed to get started. The weight began falling off quickly, which encouraged me to keep eating well, which gave me the energy to work out and so on. Good habits began breeding good habits, until it was six months later and I was jogging a 5K with ease. 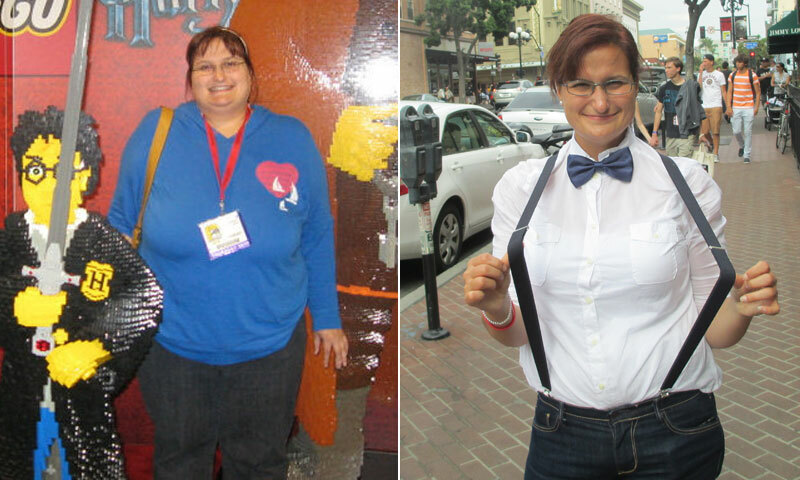 By the time I reached my 29th birthday, I was nearly 100 pounds lighter and much happier with myself. My knees no longer hurt, despite the fact that I jog six to eight miles a day, three days a week. Once, in high school, I faked a heart condition in order to get out of running a mile in gym class. It was too embarrassing for me to run in front of my classmates. Now I wonder what my teenage self would say if she saw me jogging for two hours straight. My family and friends have supported me through it all. This made it much easier for me to keep going, when I knew that so many people were wishing me well. Great job ! Love ur story u look amazing ! What an inspiration great job ! Bow ties are cool! Great work! Amazing!! Keep up the running and healthy eating! !